Crystal Forest is the slot machine with the enchanted forest/fantasy look, a title which pretty much all developers try to have in their collection. 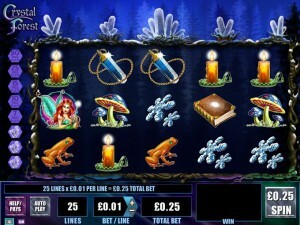 WMS is the designer behind this particular slot machine, which offers a bit of a twist, with the crystals mentioned in the title appearing to grow from the ground at the top of the reels, but in the distance you get a more normal group of trees. One of the many fantasy games offered these days, it has an often seen layout with 5 reels and 25 paylines. 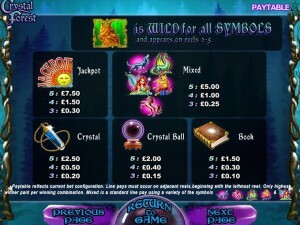 The game also offers free spins, scatter symbols, cascading reels and wilds. The best payout is only $3,750 though. 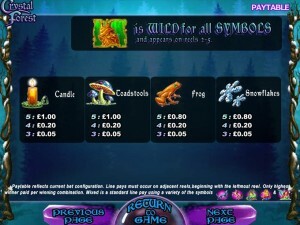 The features of Crystal Forest include the wild symbols, plus cascading reels and free spins. The wild symbol of the game can be useful, but not as much as it would be in other slots. Since it appears on four reels out of five (2nd to 5th), you don’t get it to form combinations directly. It also doesn’t apply multipliers. There are no symbols which can’t be replaced with a wild here, since it’s the only feature icon offered. The Cascading Reels feature is used whenever you have a winning combination on the game’s reels. The symbols that are part of the combos will drop off the screen, and new ones will come in to take the now empty spots. New combinations can form, and once again they will go off the screen if that happens. This can continue for a long time if you’re lucky, getting winning combinations multiple times even though you only paid for one spin. The number of times you get cascading reels in the same round will determine whether you get the free spins or not. You need four consecutive cascading reels to get 7 spins for free, five to get 10, six for 15, seven for 25 and at least eight in order to get 50 games. Another way to get this feature, with 7 free spins, is at random, at the end of any spin. Retriggering the Crystal Feature is possible with another 4+ cascading reels in consecutive order. You can cover 1 to 25 bet lines with your wagers, the coins starting at $0.01 and reaching a top value of $5. If you decide to make the biggest wager you can, the highest you can go is $125. The winner of the top jackpot will get 750 coins from this game, and the value would go up to $3,750. 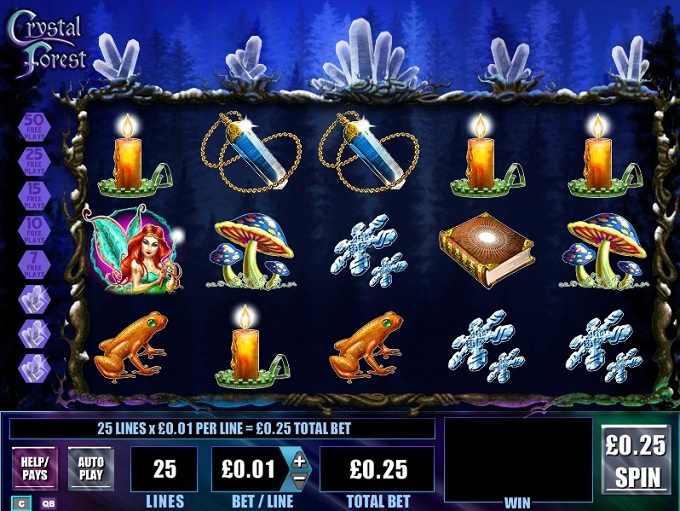 Given the nature of the theme, it’s no surprise that you are going to find on the slot’s reels images of fairies, dragons, wolves, unicorns, crystal balls and others of the same type. The fantasy inspiration is visible everywhere you look, without symbols that don’t belong in this line-up. The forest mentioned in the title is more of a regular one, but with crystal growths in it. Symbols: Sculpted Tree (wild), Jackpot Sun (750 coins), Wolf (500 coins), Dragon (500 coins), Fairy (500 coins), Piper (500 coins), Unicorn (500 coins), Crystal (250 coins), Crystal Ball (200 coins), Book (150 coins), Candle (100 coins), Toadstools (100 coins), Frog (80 coins) and Snowflakes (80 coins). It’s not a must play title, but the cascading reels and the free spins which are offered by them were a nice surprise. It’s also not the kind of game that you’re going to get rich from. 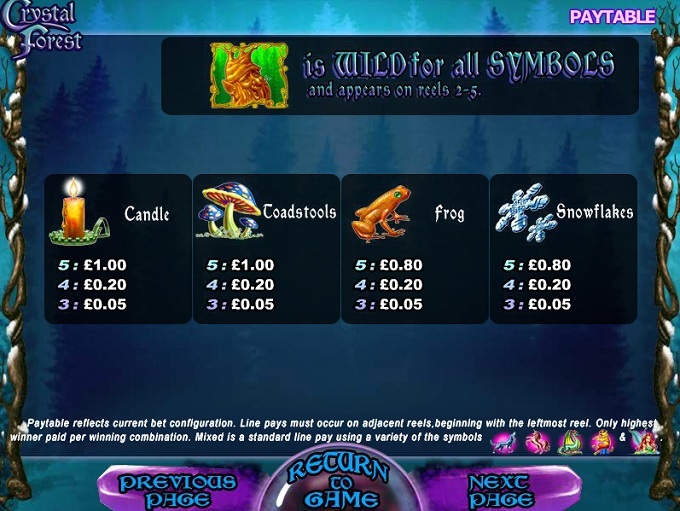 The Crystal Forest slot machine is offered through the WMS platform, so if you want to play it for real or just to practice, look out for casinos that use it.